Many United Methodists are familiar with the bi-monthly, daily devotional guide called The Upper Room. Often found in the literature racks of our churches and available online, The Upper Room is the first thing some read every morning and the last others read every night. For more than 80 years, the devotional thoughts have been shared over meals, discussed in Sunday School classes, and read aloud in hospital rooms all over the world. Whether a daily reader or new to The Upper Room, these quick facts will give you a new appreciation for this publication of The United Methodist Church. The first four issues of The Upper Room, which began as a one-issue experiment, were printed in limited quantities. Image courtesy The Upper Room. When the first, then quarterly issue of The Upper Room was released for April-May-June 1935, there was little else like it. Oswald Chambers’ devotional classic My Utmost for His Highest was first published in the United States the same year, and Our Daily Bread would not be released for another three years. After much prayer and planning, 100,000 copies of the first issue were released as an “experiment for one quarter,” according to the original motion. Worries over how it would be received were soon eased. They printed 160,000 copies of the second issue, July-August-September, then 211,000 of the October-November-December one. By the end of 1936, 500,000 copies of the seventh edition were printed. In the first issue, each daily devotion contained a quoted scripture verse, a suggested Bible reading, some brief thoughts, a prayer, and a “Thought for the Day”—a phrase believed to have been coined by The Upper Room. More than 80 years later, the daily devotions follow the same format. The name The Upper Room helps provide a framework for the mission and vision of the devotional guide. 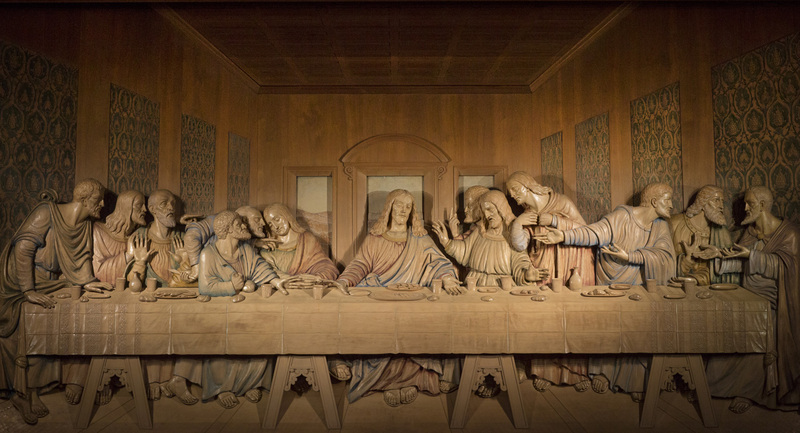 Like the upstairs room where Jesus celebrated his last supper with his disciples (Mark 14:15, Luke 22:12), the devotions offer readers an opportunity to sit with Jesus in prayer, devotion, and communion with him and one another. 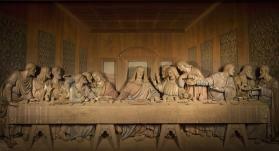 The Upper Room name calls to mind the Last Supper where the disciples spent special time with Jesus. Photo by Kathleen Barry, United Methodist Communications. Similarly, like the room where the disciples were staying at the time of Pentecost (Acts 1:13), the daily readings invite us to share the love of Jesus with everyone, as Jesus told the disciples the Holy Spirit would empower us to do. The editors of the first issue invited pastors and leaders to write the devotions. Almost immediately, however, readers began submitting ones they had written. In 1938, The Upper Room first included devotions written by readers and continues to welcome submissions from professional writers and those inspired to tell their story for the first time, both laity and clergy. Approximately 4,000 submissions are received each year! Learn how you can submit your devotion. By focusing on stories written by Christians around the world about faith in everyday life, The Upper Room inspires readers to grow as disciples of Jesus Christ. Today, The Upper Room is translated into 35 languages and reaches millions of people living in 100 different countries. In every nation and every language, we read the same scripture, the same prayer, and the same story every day, uniting us in our spiritual growth. Additionally, The Upper Room website offers opportunities for readers to connect in community by sharing comments and prayer requests. This is one more, wonderful way to share our spiritual journeys together. 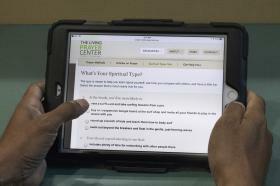 The Upper Room has grown to include digital resources like the Living Prayer Center. Photo by Kathleen Barry, United Methodist Communications. From the experimental publication of the first edition more than 80 years ago, The Upper Room has grown to form Upper Room Ministries. In addition to the daily devotional, they publish a devotional magazine for children called Pockets, one for youth called devozine, and an annual of lectionary-based, daily devotions called Disciplines. All are available in print and digitally. Upper Room Ministries also offers a variety of resources on prayer including The Upper Room Living Prayer Center where you can have someone pray with you and for you over the phone. They also lead and facilitate experiences like The Walk to Emmaus and The Academy of Spiritual Formation. Explore all Upper Room Ministries offers at upperroom.org.